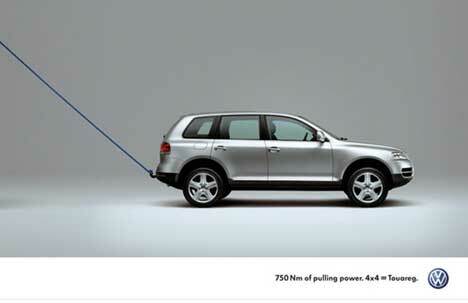 Here’s a series from a couple of years back, providing subtle mind challenges for intelligent potential VW Touareg drivers. 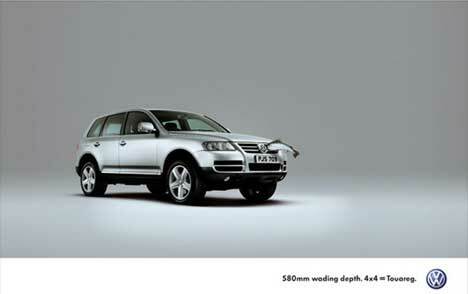 All to promote adjustable ride height, 45 degree climbing ability, 750 Nm of Pulling Power and 580 mm of Wading Depth. Adjustable Ride Height. Visual clues: a sponge and a layer of mud remaining at the top. 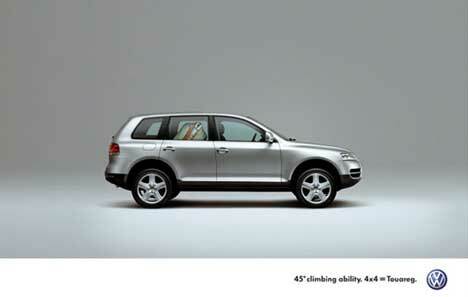 45º Climbing Ability. Visual clue: a suit on an angle. 750 Nm of Pulling Power. Visual clue: a towing rope, possibly connected to a large object on wheels. 580 mm of Wading Depth. Visual clue: a fish in the grill. 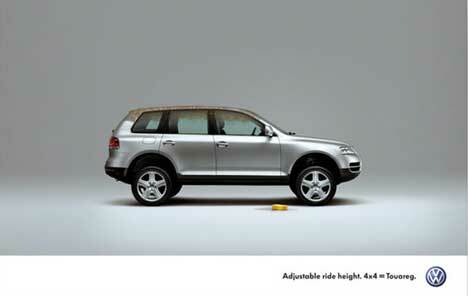 This Touareg series was developed at DDB London by creative director Jeremy Craigen, copywriter Matt Lee and art director Peter Heyes, with photographer Giles Revell and typographer Kevin Clarke.